if you’d like to sign them all by entering your details in just one form, click here. Note: The above set of NMBI petitions cover all NEW climate-damaging activities within Australia, but as noted in the States Can analaysis, existing multi-year LNG and coal export contracts will make it difficult for some states to ban new fossil fuel extraction projects. Similarly, the desire of fossil fuel companies to profit from exporting Australian resources is the main thing driving proposals for new coal mines and fossil gas extraction. Accordingly, we’ve also launched a petition to stop all NEW fossil fuel export contracts. The exports petition uses a different signing mechanism to the above 9 NMBI petitions, so please sign it separately at Ban new fossil fuel exports petition. The No More Bad Investments (NMBI) petitions to state/territory parliaments focus on just one component of the Climate Emergency Declaration and Mobilisation program called for in our petition to all levels of government in Australia. 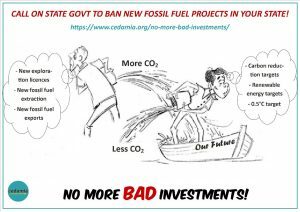 The No More Bad Investments (NMBI) petitions ask for a ban on all new climate-damaging projects in cases where safe climate alternatives already exist. In other cases, a restructuring authority would plan strategies for developing climate-safe and climate-positive alternatives and set timelines for adopting future bans. Commonwealth waters are under federal jurisdiction rather than state/territory jurisdiction, so the separate Offshore NMBI petition calls for a ban on all new offshore oil and gas exploration and extraction projects. 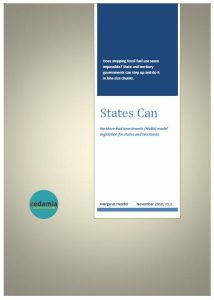 States Can NMBI analysis can be downloaded here. In case you are wondering, yes, we pronounce NMBI as ‘Nimby’. It’s a good form of Nimbyism. 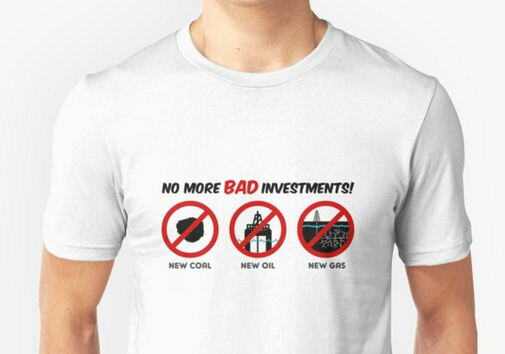 We don’t want any more bad investments in our backyard. Doing the right thing climate-wise has to start somewhere. We don’t want OUR state/territory increasing climate risk for everyone by allowing new climate-damaging projects, such as new coal mines and gas wells, new coal/gas-fired power plants, and new pipelines or other infrastruture projects that support continued use of fossil fuels. Banning new fossil fuel extraction would be a surprisingly low-cost climate strategy. See Banning new fossil fuel extraction: what will it cost us? State and territory governments have the power to set carbon reduction and renewable energy targets and to set bans on climate-damaging projects within their own jurisdiction. Climate impacts are already killing people and destroying ecosystems. Governments are remiss in their duty of care if they put us all at even greater climate risk by approving new projects that increase carbon emissions. 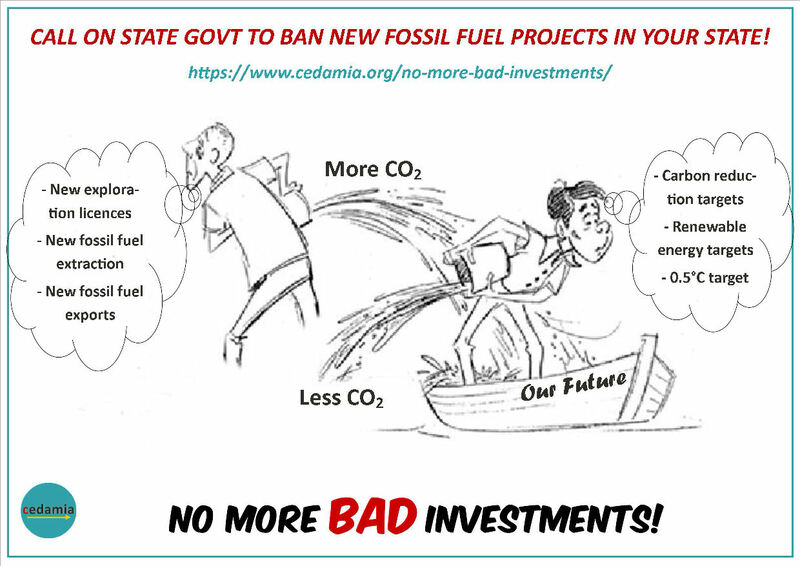 Accordingly, the No More Bad Investments (NMBI) model legislation is designed to achieve state/territory bans on new climate-damaging projects, effective immediately in cases where climate-safe alternative are already available, and to set timelines for future bans on other climate-damaging economic activity. This would be a relatively easy and logical first step towards effective climate action – when you are in a hole, stop digging! An easy step that would start reducing carbon emissions almost immediately and prevent locking in many years of avoidable emissions is to ban extension of gas reticulation networks and gas connections to new homes and buildings. 20 years ago electric appliances were very inefficient, gas prices were low, and awareness of fugitive emissions was low. Gas use for heating, cooking, and hot water was therefore common. However, all-electric households now can choose from extremely efficient options, such as reverse-cycle heating/cooling and induction cooking, and many also have solar PV. Even households without solar PV will have net-zero carbon emissions once the grid reaches 100% renewable electricity. The only way to eliminate the energy-related carbon emissions of dual-fuel households is to disconnect gas. Immediate bans would include bans on any NEW fossil fuel exploration and extraction, new coal- and gas-fired power stations, and new infrastructure projects intended to support continued use of fossil fuels. 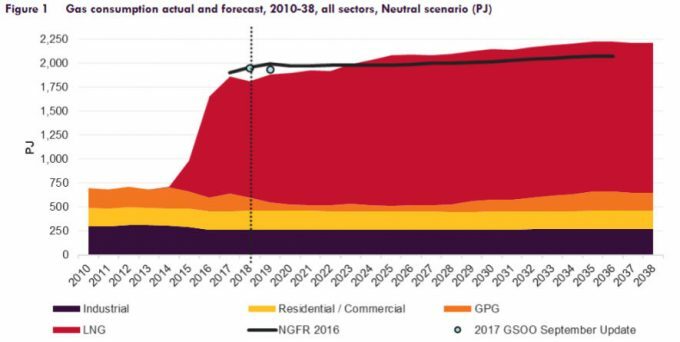 The resultant market certainty would encourage rapid rollout of enough replacement renewable energy generation and storage to reliably ‘keep the lights on’ even when aging power stations start to close and even if current extraction sources start to approach depletion. The only gas demand that is currently growing is the demand for more LNG exports. Australia already extracts three times as much ‘energy’ as we use within our borders, and the transition to renewables already underway suggests we’ll be using less in future. 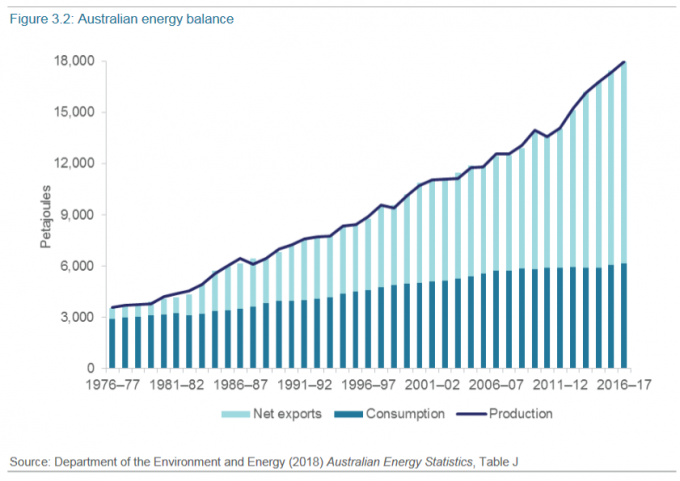 It is highly likely that any new coal mines or gas wells would simply add to our high level of fossil fuels exports. Under carbon accounting practice, fossil fuel exports fly under the radar in terms of meeting carbon reduction targets. The carbon footprint of burning fossil fuels is counted as the responsibility of the country that burns them, rather than adding to the carbon footprint of the exporting state/territory. But exported fossil fuels put us all at greater climate risk regardless of where they are burned. 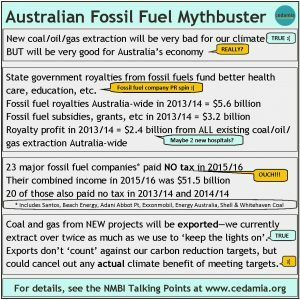 Australia does get some benefit from fossil fuel exports via royalties, taxes, and export income despite many of the extraction companies being foreign-owned, but royalties and taxes glean much less than you might expect (see the Talking Point links below for details for each state). 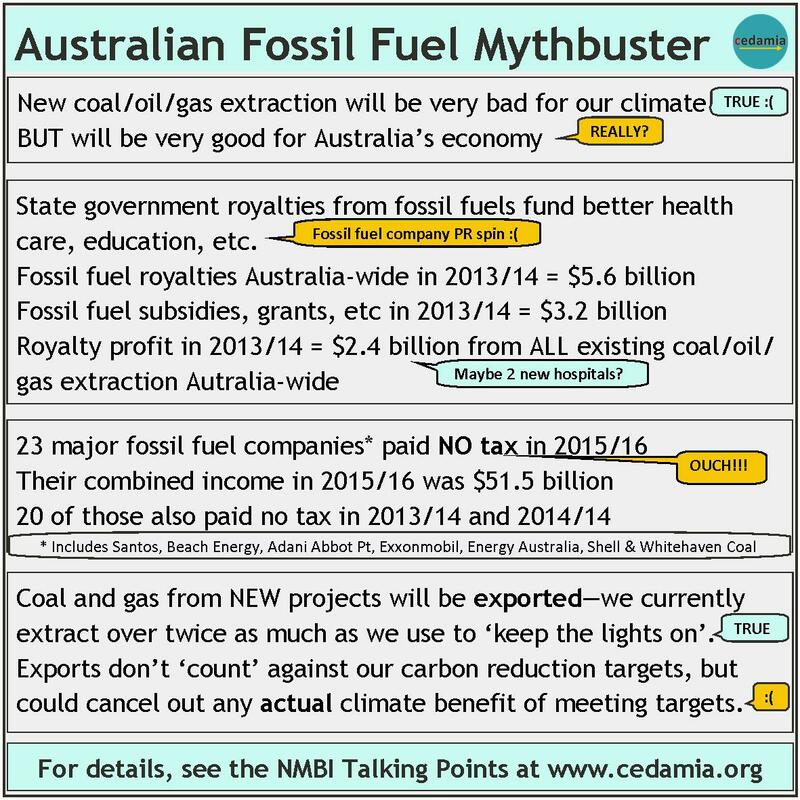 Australia’s export income is important even if not huge, but we could and should be developing new climate-safe exports to make up for the absence of NEW fossil fuel exports after NMBI legislation bans new fossil fuel extraction projects. The climate benefit of one state or territory banning new climate-damaging projects might be small compared with the global scale of the climate emergency, but it would demonstrate not only that such thing is possible but relatively easy. It could be an important catalyst inspiring other states/territories and nations to do the same. Please get in touch if you would like to partner with us on launching a similar petition in your state or territory or if your group would like to support any of the NMBI petitions and campaigns! 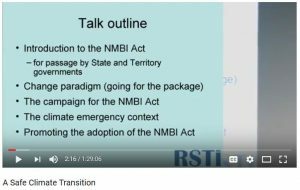 The NMBI Q&A doc places the No More Bad Investments model legislation in the context of the climate emergency and explains how the legislation might be implemented. Download the Q&A Word doc. It’s a bit like the First Law of Holes – when you’re in a hole, stop digging! It doesn’t make sense to have carbon reduction targets and timelines for transitions to renewable energy on one hand, while on the other hand state/territory governments continue to give approval to new fossil fuel and forestry projects that make the climate crisis even worse than it currently is. 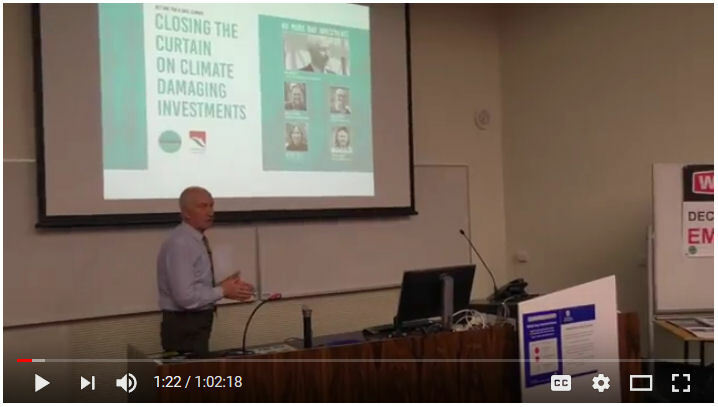 BZE event video of Philip Sutton talking about No More Bad Investment model legislation and paradigm. Thanks to Dan Monceaux of Danimations for the NMBI graphics. 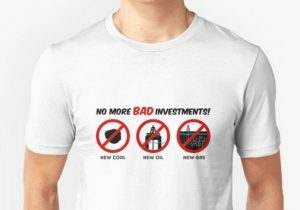 T-shirts and mugs featuring his No More Bad Investments graphics can be ordered via the Redbubble links below.